I've been wanting to try a pressure cooker for a long time. My mom was always saying that she missed making beans in a pressure cooker but then would tell me horror stories about getting scalded. I am using it all the time and I'm still figuring out all the uses. It was pricey but I am using it at least once a day, sometimes two. Anyone have a new favorite kitchen gadget? edited to add: I sound like an infomercial. I don't work for them, I just happen to really like the pot. Last edited by Agla; 10-10-2014 at 08:47 AM. I jave this on my christmas wish list!! No one I know has heard of it. They kind of looked at me like I was nutty when I described it. Our family is trying to go %100 homemade - so i was searching for a yogurt maker and a presure cooker and came acrossed it- i cant wait to try it when i get my hands on it. My sil gave my mil one for Christmas a couple of years ago. As far as I know she still hasn't used it. I use a pressure cooker. The aluminum kind of worries me though. What does the inside of yours look like? Is it aluminum too? My dh was put on the DASH diet. I wanted a quick option to make beans without prepping once a week and freezing or using canned. I made yogurt for the first time this week. The cooking takes a long time but the process is really simple. Borrow it for a long time. The inner pot is stainless steal. I can take a picture. Hahahaha! I wish I had the guts to borrow it for a long time! Stainless steel! That may have me sold! I'll have to look more into it. I'm assuming you are using dried beans, how long does it take to cook? Your mother prefers pressure cooked beans? I bought a pressure cooker/canner and cooked beans in it. The flavor isn't as good as just cooking them the longer way I thought. Kind of bland even though I put all the same ingredients into the pot. 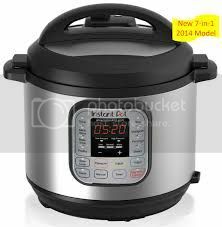 I love my pressure cooker but never use it as a pressure cooker, just as a really large, very sturdy pot for bulk cooking. My favorite kitchen gadget is an emersion blender or hand held blender. I use them for everything. Wear mine out so I don't feel bad putting out for an expensive one that lasts longer. I checked it out. Looks really nice. Do they have a larger version though? I haven't tried pressure cooking beans yet. That's good to know they don't taste the same. Maybe it has a different taste with the stainless steel?